The biggest party night of the year is right around the corner and there’s no better place to be than right here on Folly Beach. If ringing in the New Year on the beach with good food, tunes, and drinks sounds like your idea of a great time, then you’ll want to make sure you’re at the New Year’s Eve Beach Bash hosted by Folly Beach’s Tides hotel. This event promises to be the best party in town and is one of the only beach-front celebrations around. Plus, there’s nothing better than ending one year and beginning the next while partying on the beach. This event starts at 8pm and features an open bar, lavish buffet, and plenty of music for party goers to get wild and crazy to. DJ C Nile will rock the lower floor of the Blu bar and restaurant while Tru Sol will be playing live music upstairs. A champagne toast and fireworks show will go on right at midnight to usher in 2012. 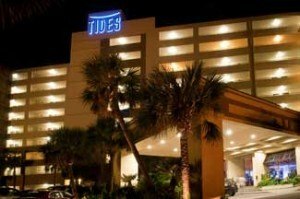 If youre already staying at the Tides (and even if youre not) tickets are $90 plus tax per person. Or, plan a trip now for two nights at the hotel and take part in the New Years Eve Beach Bash for just $659. The party and hangover recovery will continue on New Year’s Day as a yummy breakfast buffet will be served. Then, from 1-4 take part in the oyster roast on the back deck. You’ll also get a chance to watch or take part in the Polar Bear Plunge, and if that doesn’t shock the effects of the previous night’s celebration out of your system nothing will. To book reservations for this event click here! are tickets still available for new years eve? I have been trying to reserve two tickets for the new year's eve bash but can not find how to when I press 'click here'. Please help me reserve these two tickets. Thank you.